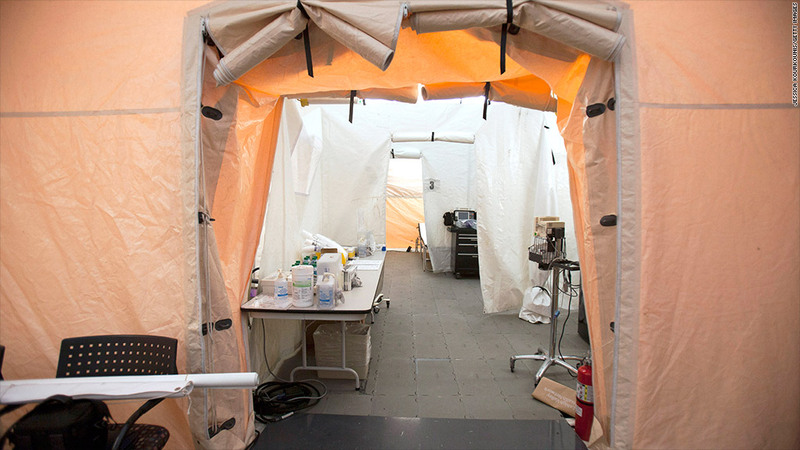 A tent outside an Allentown, Pa., hospital handles the influx of flu cases in the region. As flu season hits, a lot of people who should be home sick will instead be dragging themselves to work. While some are likely just workaholics, others don't have a choice: An estimated 41.7 million American workers can't take sick days, according to the Bureau of Labor Statistics. That's nearly a third of the nation's employees, and a problem that raises health risks for everyone. The nation's current flu epidemic is more widespread in part because of the many sick people who can't afford to stay home. A study published last year in the American Journal of Public Health estimates that an additional 5 million people became infected with flu symptoms in 2009 alone due to workplace policies, such as lack of paid sick leave. Nearly 80% of employees with full-time jobs get paid sick days, according to the BLS, but only 25% of part-time workers do. Those figures don't include the millions of workers who are self-employed, for whom staying home can often mean being out of business for the day. That's the case for Diane Biancamano, 44, a freelance public relations professional from New Jersey who left her job in the corporate world last year. Biancamano came down with the flu this week, but forced herself to work for fear of losing income and falling behind in her projects. "It's very stressful to be laying there sick and worrying about making ends meet," she said. While providing sick days may seem expensive for employers, withholding them is also costly. The Centers for Disease Control estimates that even a typical flu season costs businesses about $10.4 billion in direct costs for hospitalizations and outpatient visits for adults. And that doesn't even include the cost of lost productivity and sales. Another problem: Sick children whose parents can't stay home with them are more likely to be sent to school or day care, spreading the infection to other children, according to Heather Boushey, senior economist at the Center for American Progress, a liberal think tank. And sick employees can spread illnesses to customers and other members of the public. A study released in June by the Food Chain Workers Alliance said 79% of food system workers -- those in production, distribution, sales and restaurants -- don't get paid sick leave. Perhaps as a consequence, 53% surveyed admitted to working while sick, according to the FCWA, a coalition of workers' rights groups. The BLS statistics show that even 23% of workers in the healthcare and social assistance sector are without access to paid sick days. Boushey said the United States is the only developed country without a law guaranteeing employees the right to paid sick days. She said even most undeveloped countries have laws that guarantee paid sick days. "The U.S. is very much an outlier," she said.